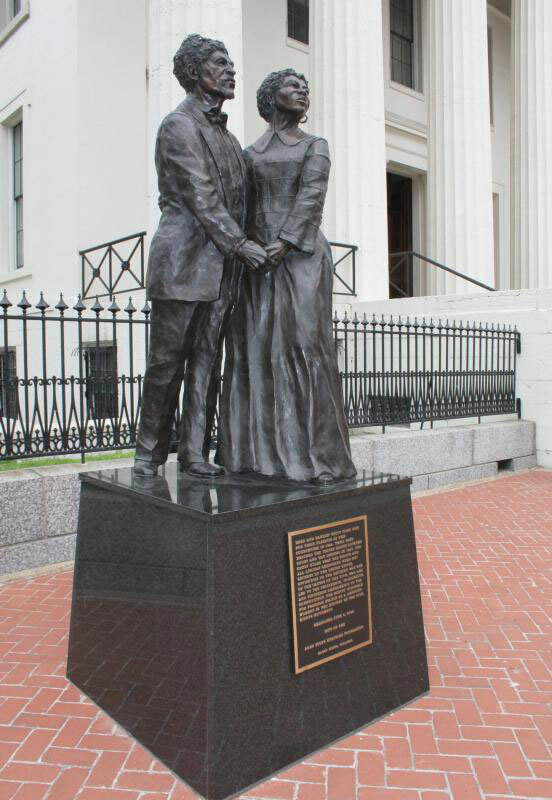 Statue of Dred Scott and his wife Harriet. Courtesy of the National Park Service. One of the most notable cases ever heard for American Slaves were tried in the United States was heard in St. Louis' Old Courthouse. The Supreme Court decided the case in 1857 and hastened the start of the Civil War. Dred Scott was about 50 years old when the first case began in 1847. He was born in Virginia, and was the property, as his parents had been, of the Peter Blow family. He had spent his entire life as a slave and was illiterate. Dred Scott with The Blows moved to St. Louis in 1830 along with Dred Scott but was soon sold to John Emerson, a military surgeon stationed at Jefferson Barracks. Dred accompanied Dr. John Emerson to posts in Illinois and the Wisconsin Territory, where slavery had been prohibited by the Missouri Compromise of 1820. Scott married Harriet Robinson, also a slave; they later had two children Eliza and Lizzie. John Emerson married Irene Sanford in Louisiana and in 1842, the Scott's returned with Dr. and Mrs. Emerson to St. Louis. After John Emerson passed it is believed that Mrs. Emerson hired out Dred Scott, Harriet, and their children to work for other families. 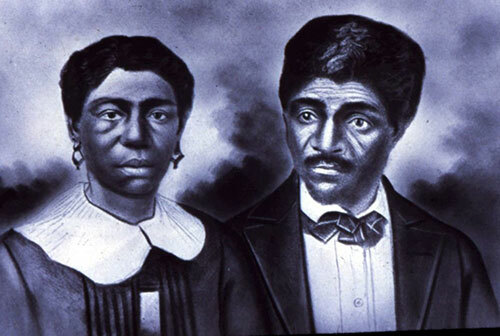 Dred Scott and his wife Harriet. Courtesy of the National Park Service. 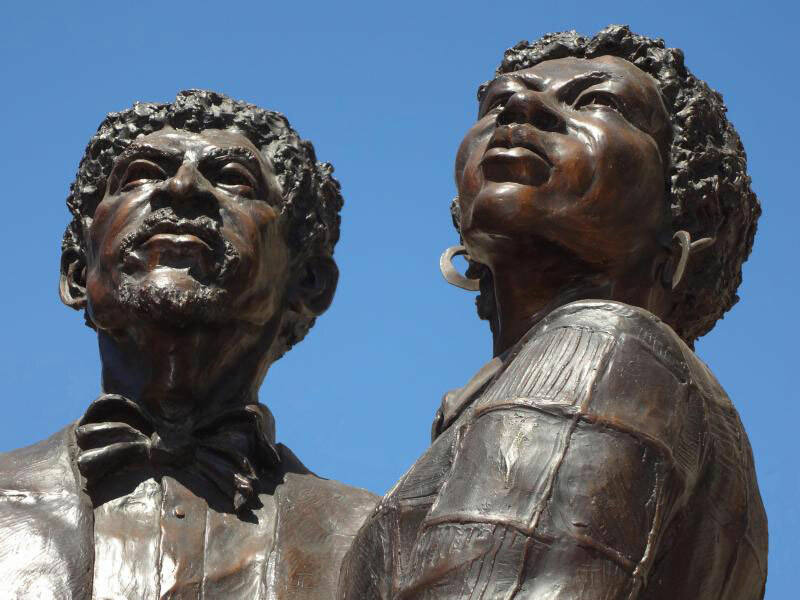 Dred Scott and his wife Harriet filed suit against Irene Emerson for their freedom on April 6th, 1846, for almost nine years, Scott had lived in free territories, yet made no attempt to end his servitude. It is unknown why he chose this particular time for the suit, although historians have considered three possibilities: He may have been disgruntled with being hired out; Mrs. Emerson might have been planning to sell him, or he may have offered to buy his own freedom and been refused. There was no political background for the suit. Some people thought his friends in St. Louis who opposed slavery had encouraged Scott to sue for his freedom on the grounds that he had once lived in a free territory. In the past, Missouri courts supported the doctrine of "once free, always free." Dred Scott could not read or write and had no money. He needed help with his suit. John Anderson, the Scott's minister, may have been influential in their decision to sue, and the Blow family, Dred's original owners, backed him financially. The support of such friends helped the Scotts through nearly eleven years of complex and often disappointing litigation. The law in 1846 did not consider whether the Scotts’ civil rights were at stake. The consideration of the property rights of the slave owner was the focus of this case. Slaves were valuable property to the slave owners. Slaves were owned property like cars or any other property you own today. The question of the court is could you take away property based on where the owner lives. Example would be if you drove your car from Missouri to Illinois, and the State of Illinois said that it was illegal to own a car in there, could the courts take the car away from you when you returned to Missouri? At the time only a few whites considered slaves human during the Dred Scott's lawsuit, today we understand that it is deplorable to hold people against their will and force them to work as it was in the time of institutional slavery.